THE Orientation Programme for about 700 newly admitted students of Undergraduate and Graduate programs at the American International University Bangladesh (AIUB) for the Summer Semester 2008-2009 was held on May 21 & 23, 2009 at the AIUB Auditorium. The students and their guardians were informed about the Academic procedures, rules and regulations including registration, examination systems and other academic matters. The Founder Chairman Dr. Anwarul Abedin, the Vice Chancellor Dr. Carmen Z. Lamagna, Pro-vice Chancellor Prof. Anwar Hossain, Vice President (Academic) Prof. Tafazzal Hossain and Deans from different departments spoke on the occasion. Prior to the students orientation session, an orientation programme for newly appointed teachers of the University was also held on May 20, 2009 at the AIUB Auditorium. After the core session of the orientation programme, a Question and Answer session was held by the Vice Chancellor who replied to the various queries raised by the students, guardians and the newly appointed teachers. The AIUB Trustee Board Members Hasanul A. Hasan and Ms. Nadia Anwar, the Registrar, Deans, Department Heads, teachers and officers concerned of the University also attended the event. THE American Center invited Independent University Bangladesh (IUB) Media and Communication Department for the World Press Freedom Day recently. The invitation began with a brief introduction by the director of the American Center, who talked about the ideas that both students and faculties have about the Freedom of Press. After the introduction was given, a fascinating docudrama about one of the seminal broadcast journalists from America, Edward Murrow, a pioneer television journalist at CBS channel, was showcased. Brian Armistead, the senior officer of Development of Voice of America and a columnist of Baltimore Sun newspaper, had a discussion session with the faculties and students at the end of the showcase. He emphasized on different subjects regarding how freedom of press is becoming more difficult and increasingly being controlled by the corporate power of the media. The EEE department of CUET organised a three week long industrial training programme at the Training Institute for Chemical Industries (TICI), Polash, Narsingdi. The participants were the students of the 2005 batch of the EEE department. A total 120 students also visited the Ghorashal Power Plant and the Urea Fertilizer Factory. Tofael Ahmed and Joyprokash Chakrobati, lecturers of EEE, accompanied the students on the tour. The first-ever international conference on Latin American Literature was held in the Senate Hall, Jahangirnagar University on May 24-25. Professor Nazrul Islam, Chairman, University Grants Commission of Bangladesh, inaugurated the programme as the chief guest. Professor Shariff Enamul Kabir, Vice-Chancellor, Jahangirnagar University, was present as the special guest.Organised by the Department of English, Jahangirnagar University, a total number of 17 papers were presented by delegates and scholars from UK, USA, London, Mexico, Argentina, India and Bangladesh. The Keynote paper of the conference, The reflections on Latin American Literature, was presented by Norman Thomas di Giovanni; who received the Argentine Medal of Honour for his contribution to Argentine Literature. Norman Thomas is a highly respected translator and editor who worked in collaboration with Argentine writer Jeorge Luis Borges. Plenary session: marx,marquez & beyond, and detourned genre. PAHARI Chhattra Parishad (PCP), the student wing of United Peoples Democratic Front (UPDF), organised a discussion on 20 May at the Town Hall Premises in the hill town Khagrachhari to mark two decades of the PCP. PCP Central Committee President Riko Chakma presided over the discussion while UPDF Khagrachhari District Coordinator Ujjal Smrity Chakma was the chief guest. Among others, Hill Women Federation (HWF) President Sonali Chakma, Gonatantrik Jubo Forum President Mithun Chakma and PCP leader Kahalaching Marma spoke on the occasion. The speakers urged the government to formulate a special policy to ensure mother tongue based education for the indigenous children in the Chittagong Hill Tracts. After the discussion, a rally participated by thousands of indigenous people marched through the main roads of the hill town. MASTERMIND competition termed as 'battle of brains' of International University of Business Agriculture and Technology (IUBAT) ended through its final round arranged in the Conference Hall of the university. The participating contestants demonstrated their intellectual pursuit in a tough contest facing varied meritorious questions on contemporary world. Jannatul Ferdous Taposi, a student of Bachelor of Computer Science and Engineering was adjudged champion by the panel of judges amongst seven competitors. Earlier, top ranking students of different discipline of IUBAT participated in the mastermind competition. Prof Dr. M Alimullah Miyan Vice-Chancellor of IUBAT and Chief Guest of the event in a short speech on the occasion termed this competition as the battleground of intellectuals. Tanvir H. De Wan, Coordinator of Business Administration and Jenefer I Carlos, panel of Judges organized the event. NURUL Islam Nahid, Education Minister, during his speech at North South University (NSU) on May 17, 2009, made a strong and explicit appeal to grant full tuition waivers to adibasi (indigenous) students. The Chairman, Board of Governors, NSU Foundation, and the NSU Vice Chancellor readily agreed and a decision has been made to set aside two full tuition waivers per semester for bright and needy indigenous students. In order to receive the financial aid, the adibasi students will have to meet the eligibility requirements for NSU admission and qualify in the admission test. This program is meant to attract talented and financially underprivileged students of indigenous ethnic origin at NSU to enhance diversity and promote understanding. TRANSPARENCY International Bangladesh (TIB) and Friends Forum jointly arranged a cultural festival at Khulna University on 12 & 13 May with the theme - 'The Invincible Youth Will Surely Resist Corruption.' Vice Chancellor of K.U Prof. Saifuddin Shah inaugurated the festival. Adviser of Friends Forum & Head of ES Discipline Dilip Kumar Datta chaired the programme while Hafizur Rahman, Convenor of CCC in Khulna City was the chief guest. The events of the occasion included a recitation programme by 'Onkar Srenuta' and a corruption related drama by 'Voirobi' and 'Rupantor.' An Anticorruption Cartoon Exhibition was also held in the Cafeteria. The underground band 'Noise Factory,' Chondana Mojumder and Kiron Chandra Roy were also among the performers. Finally, all the students took the oath that they will never be engaged in any form of corruption. THE Aga Khan School, Dhaka (AKS,D) recently held its Annual Cultural Function for the Primary, Junior and Senior Schools at the Senior campus. The programme included singing, dramas and dancing which reflected the moral values and traditions of our Bangladeshi culture. The various acts were highly appreciated by the audience. The functions concluded with messages from the Heads of School which acknowledged student performances and the continued support and encouragement that we receive from our parents. A seminar on Digital Bangladesh was held at United International University on March 5, 2009. Lt. Col. (Retd.) Faruk Khan, Minister for Commerce - Government of the People's Republic of Bangladesh was present in the seminar as chief guest. UIU Vice Chancellor Prof. Dr. M. Rezwan Khan presided over the first session while Prof. Abdelaziz Bouras, University of Lumiere LYON2-France, was in the chair in the second session. UIU Pro-Vice Chancellor Prof. Dr. Chowdhury Mofizur Rahman Coordinated the program and Prof. Jamilur Reza Choudhury, Vice Chancellor of BRAC University was the keynote speaker of the seminar. Prof. Hongnian YU, Staffordshire University -- UK, Dr. Keshav Prasad Dahal, University of Bradford - UK, Prof. Abdelaziz Bouras, University of Lumiere LYON2-France, Prof. Andras Gabor, University of Budapest - Hungary, Prof. Matteo Mario Savino, University of Sannio - Italy, Dr. Alamgir Hossain, University of Bradford UK delivered speeches in the seminar. The chief guest Lt. Col. (Retd.) Faruk Khan, in his speech emphasized the need of spreading ICT education throughout the country and expressed the commitment of the Government to make a Digital Bangladesh. He also lauded the roles of EU-Sponsored e-LINK Project, Bradford University of UK and United International University in promoting higher education on ICT and other disciplines. He also opined that the scholarship scheme of e-LINK Project would certainly contribute a lot in this regard. DR. A A Mamun, Professor of Physics, Jahangirnagar University, has been selected as the recipient of Frieddrich Wilhelm Bessel Research Award (Alexander Von Humboldt Foundation, Germany) in recognition of his past accomplishments in research and teaching. This prestigious research award includes 45,000 (fourty five thousand) Euros along with an invitation to undertake prolonged periods of research in collaboration with scientists in Germany. This is the first time a Bangladeshi Scientist has received this prestigious research award. Prof. Mamun, in recognition of his notable contribution in physics, has also been awarded a number of national and other international awards. Dr. Mamun has made a substantial contribution towards the published literature of theoretical plasma physics. He has published more than one hundred fifty research articles in American/European scientific journals and has written a textbook on introductory dusty plasma physics, published by the Institute of Physics, London. Two members of Bangladesh team who have participated in International Olympiads and received 1 Golden and 1 Bronze Medal have returned home on 21st May. 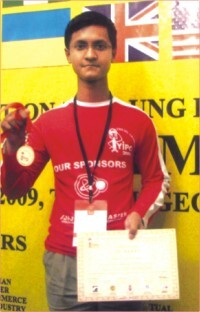 Najmush Sakib Khan, student of Int'l Turkish Hope School and Mathematics Teacher Mehmet Nevzat Solak represented Bangladesh in the 3rd International Young Inventors Project Olympiad which was held between 14 May and 16 May 2009, in Tbilisi, Georgia and International ICT Olympiad which was held between 10 may 2009, in Ankara, Turkey. 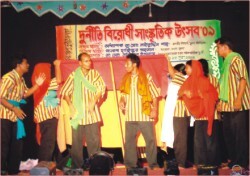 The team had left Bangladesh for the Olympiads on 5th May, 2009. Firstly they participated in International ICT Olympiad which was held between 10 May and 12 May in Ankara, Turkey. In this Olympiad Najmush Sakib Khan, student of Class 9 with his project named "The future of Internet" received Bronze Medal among more than 5000 projects from 32 different countries. Khan received his Bronze Medal from Turkish Minister of Communications. Some other high officials were also present in the Prize Giving Ceremony. After this Olympiad they went to Georgia to participate in the 3rd International Young Inventors Project Olympiad which was held between 14 May and 16 May in Tbilisi, Georgia. In this Olympiad the same student with his project named "Calculating Area or Perimeter of a Polygon Without Using Pi Number" received Gold Medal among 60 different countries. In this Olympiad the mother of President of Georgia, Country Representative of European Union, Turkish Ambassador to Georgia and other high officials were present and Khan received his Gold Medal from the mother of President of Georgia. ON 16 May 2009 a discussion meeting was held among the school authorities, teachers and guardians on the occasion of declaration of 1st Term Exam's Results at Sara International School & College located at Dhanmondi, Dhaka. The Chairman of School Governing Body Ln. Alhaj Md Nazrul Islam Sikder handed over the Result Cards to the students on the occasion. Principal GP M Shahjahan (Rtd. ), Director Md. Mosharaf Hossain and Md Ayen Uddin were also present on the occasion. Leading University organized an orientation and cultural program for the students of Spring Semester 2009 at the campus auditorium. Professor Dr ABM Shahidul Islam, Vice-Chancellor of Leading University advised the fresher that only memorising the lessons is not enough but understanding the theme of the study is important and hard work is the only way to becoming a worthy citizen. Other distinguished guests Professor Dr M R Kabir, Syndicate member of LU & Pro Vice-Chancellor of University of Asia Pacific, Professor Dr Abbas Ali Khan, Dean, Faculty of Business Studies, and Professor Zainul Abedin Chowdhury, Campus-in-Charge also gave their valuable speech to the students. Along with them renowned Columnist of The Daily Financial Express Mr M S Siddiqui, PhD Researcher, CEO of Bangla Chemical & Hydro Machine Ltd. as well as guest faculty of LU welcomed the students. Among the permanent faculty members Miss Arefa Parvin Taposhe, lecturer of Law introduced the students with the Rules and Regulations of the University and cordially invited them to join the Leading University family. A cultural program was presented by the students of Leading University that included Drama, Country songs, Magic, Fashion Show, Band Show etc. which were greatly appreciated by the audience.